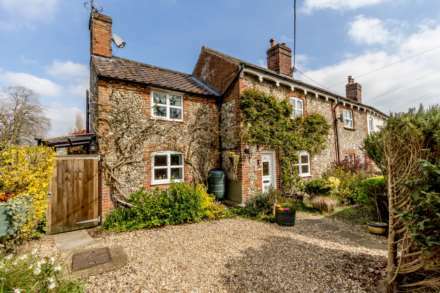 Backing onto open farmland with easily accessible countryside walks, Longsons are delighted to bring to the market this delightful mid terrace character cottage. Dated circa 1820, the property is formally of the former Bradenham Hall workers cottages and simply oozes character with lovely countryside open outlook to the rear. The property offers, living room, kitchen, two bedrooms, shower room and cottage gardens to front and rear. Off road parking to the rear. Bradenham is a popular Norfolk village with church and a village pub, `The Lord Nelson`. 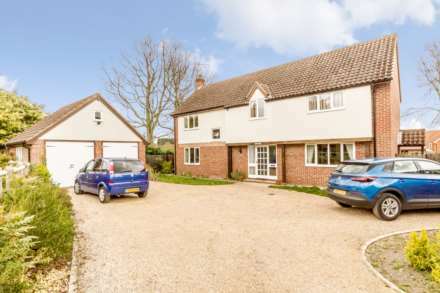 There is good road access to the nearby villages of Shipdham and Necton, both offering a good range of amenities. With the nearby market town of Swaffham offering a wealth of amenities including a Waitrose supermarket, a good selection of shops, pubs and restaurants, three doctors surgeries and free parking throughout the town. Small brick built porch with UPVC double glazed windows to front and side, UPVC double glazed door to front garden and a tiled roof. Two double glazed lattice windows to front, exposed ceiling beams, television point, stairs to first floor, two radiators, wood effect laminate flooring, window to rear over kitchen, stairs to first floor. Fitted with a range of wall and base level kitchen units with rolled edge work top over, sink unit with drainer, space for cooker (calor gas) exposed wall beam, space and plumbing for washing machine, ceramic tiled flooring, door to rear garden. Double glazed window to rear with far reaching views over the countryside, built in wardrobe, original exposed ceiling beams, cupboard housing hot water cylinder with shelving. Suite comprising - double shower cubicle, wash basin, spotlights, fully tiled walls, sky light window. Very well maintained, delightful cottage garden. Gated access to the front, path winding through to front door, circular patio area, a good selection of shrubs and flowers set within areas laid to decorative chippings. Brick weave patio seating area, shingle and rockery garden areas, wooden garden shed, calor gas bottle storage, gate to rear providing access to parking area.